The Government Expenditure & Revenue Scotland (GERS) figures for 2014-15 were published this morning1. If you've followed Chokkablog then the figures will come as no surprise. All figures quoted in this blog use the Scottish Government's preferred geographic share definition for allocating oil revenues (Scotland is shown keeping all of "our oil") and have been deflated (put in real £ 2014-15 terms) using the latest UK GDP deflator. 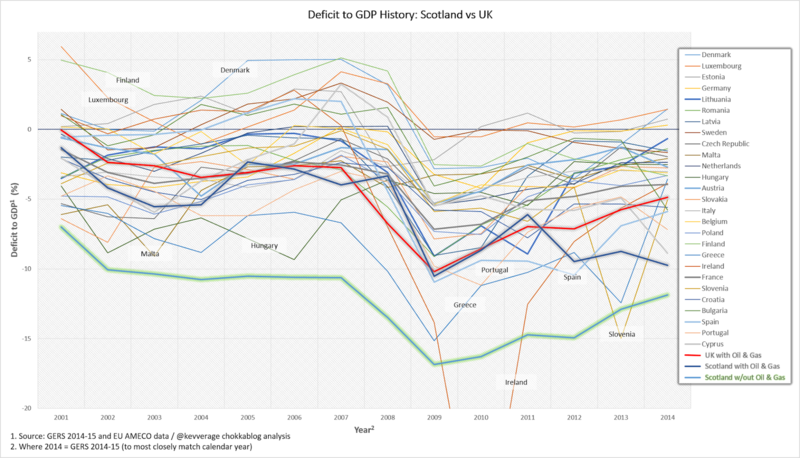 In simple terms: Scotland was running a deficit in 2014-15 that was twice as large as that we shared with the UK (whether you look at it on a per capita or % GDP basis). On the basis that we take a population share of debt while we're in the UK, the difference between the amount of debt we accrued by being in the UK as opposed to being independent was £1,400 per capita (the difference between £2,800 and £1,400). Gross that up by our population of 5.3 million and the deficit gap versus the UK is £7.4bn. For the avoidance of doubt: this is not our deficit, it is how much bigger our deficit would be if we were independent (than that we share by being within the United Kingdom). These figures relate to April 2014 - March 2015 and include £1.8bn of oil revenue for Scotland - this means the onshore deficit gap (i.e. how much worse off we'd be if we didn't have any oil revenues) was £9.2bn. Given that this year (15-16) oil revenues are predicted to be only c.£0.1bn we will (all else being equal) be looking at a deficit gap of c.£9bn. It is now clear that, far from scaremongering, those of us who a year ago warned of an £8bn - £9bn annual deficit gap if we voted Yes were pretty much on the money. To put this in referendum propaganda terms: a vote for Yes was a vote to make us immediately £1,400 a year worse off for every man, woman and child in Scotland. Of course as an independent country we would face a series of new challenges and opportunities that may make that situation better or worse. What's clear - now undeniable - is that the starting point (based on taxes we're used to paying and public spending we're used to receiving) would be £1,400 per person per year worse off than we are by remaining in the UK. That's £2,800 per tax payer. To understand whether this would really matter - would we need to take drastic action or simply choose to fund this higher deficit with yet more debt? - we need to look at these deficit numbers in context. These 2014-15 figures would be the actual numbers we'd be using to negotiate any currency solution and the terms of (indeed the very existence of) our EU membership. One of the less intelligent comments thrown out during debates about the GERS figures and what they tell us about Scotland's deficit is the statement that "every country runs a deficit" as if the scale of the deficit is irrelevant. Let's look first at the evolution of this deficit over time. The lower line is our onshore deficit (i.e. excluding any oil & gas income) and the upper line is our deficit including oil & gas. This highlights a very important dynamic: although our overall deficit is worsening, our onshore (underlying) deficit position has been improving since 2009. As oil declines the lines clearly converge. 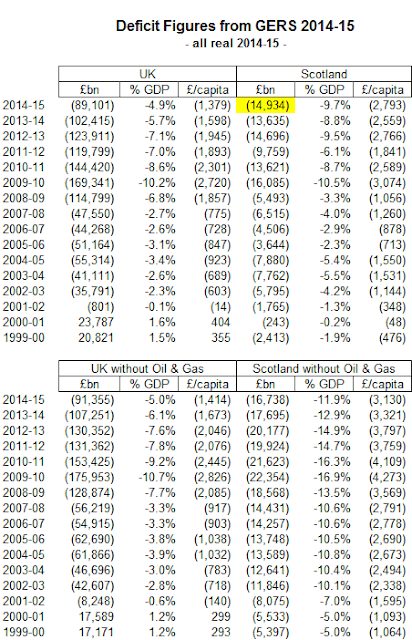 We can see clearly that oil & gas has a relatively small impact on the UK's total deficit to GDP and that Scotland's onshore deficit (excluding oil & gas) is consistently worse than the UK's (for reasons readers of this blog will understand well, primarily higher expenditure per capita). The improving trend in onshore (underlying) deficit to GDP tracks the improvement in the UK as a whole. Given the common fiscal approach this is unsurprising. 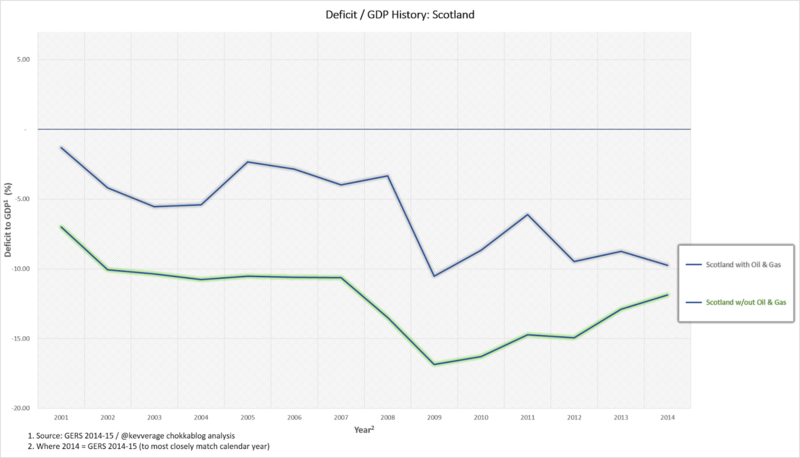 Clearly we don't know what would happen under alternative economic plans, but the current path being pursued by the UK is undeniably leading to a reduction in the scale of the onshore deficit for both the UK and Scotland. 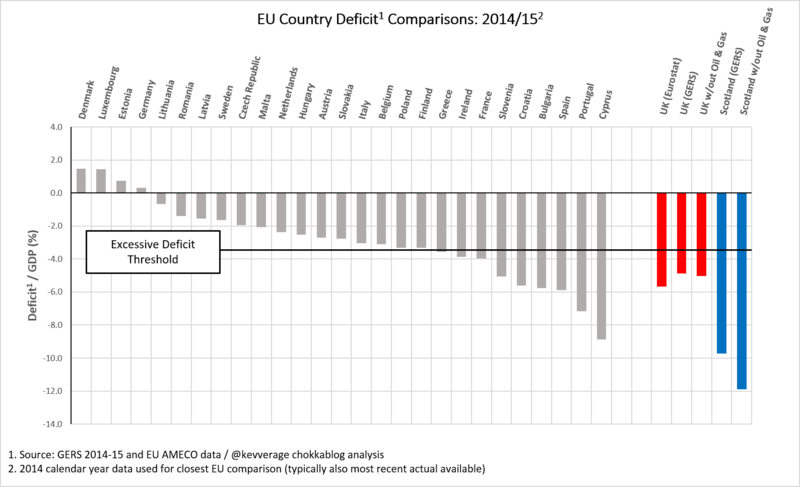 We'll explore the reason why Scotland's onshore deficit is so much worse than the UK's later in this blog, but first let's look at the scale of the deficits we're looking at in an EU context. Remember: not only would we be having to work out how to fund this excessive deficit, we'd be taking these figures to the negotiating table to try and renegotiate our EU membership if we'd voted Yes. 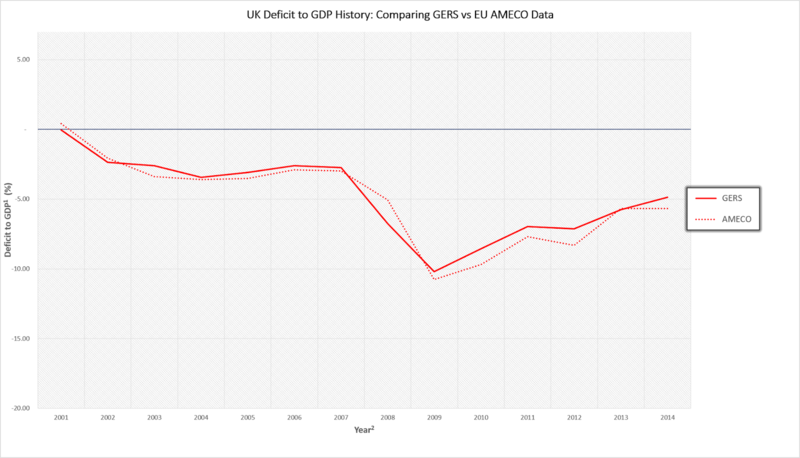 The rather gloriously named "corrective arm" of the EU Stability and Growth Pact "ensures that Member States adopt appropriate policy responses to correct excessive deficits by implementing the Excessive Deficit Procedure (EDP)" and defines an excessive deficit as 3% of GDP. Let there be no doubt: if Scotland had voted Yes and we were facing independence, seeking a currency solution, incurring the costs of separation and negotiating EU membership ... we would be forced to take drastic fiscal steps to reduce this deficit. We would inevitably face tax rises and/or far deeper public spending cuts than we're currently experiencing. As it is - as secured by the fiscal framework agreement - Scotland benefits from a fiscal transfer from the rest of the UK. On the generally accepted assumption that we incur only our population share of the UK's debt this means we are benefiting by about £8bn a year currently as a result of voting No. This is how pooling and sharing works - its the quid pro quo for the massive contribution Scotland made to the UK during the oil boom of the 1980's. Anybody who has read FFA for Dummies will hopefully understand the following graph. Unlike the analysis above which compares Scotland on a % GDP basis with the UK as a whole, this analysis compares us on a per capita basis with the rest of the UK (i.e. the UK without Scotland). As explained in FFA for Dummies: Methodology this approach gives similar answers (particulalry now GDP/Capita is so similar between Scotland and the UK) but has the advantage of putting the numbers in a form people can relate to. The figures are almost identical to those we started this blog with: with the most recent year's data now available we see £7.6bn of the £9.2bn onshore deficit gap that exists between Scotland and the rest of the UK revealed by falling oil revenues. This deficit gap is clearly mainly due the higher spend per capita in Scotland than the rest of the UK. As this blog has covered before (see FFA for Dummies) this is in large part due to Scotland's lower population density, remote communities and unique demographic challenges. None of these would miraculously go away if we were independent. We really should be thankful we voted No. As is the way with these things prior years' data have been restated. It's worth noting that there's a material change to TME in 2013-14 leading to a £1bn increase in the reported deficit for Scotland. 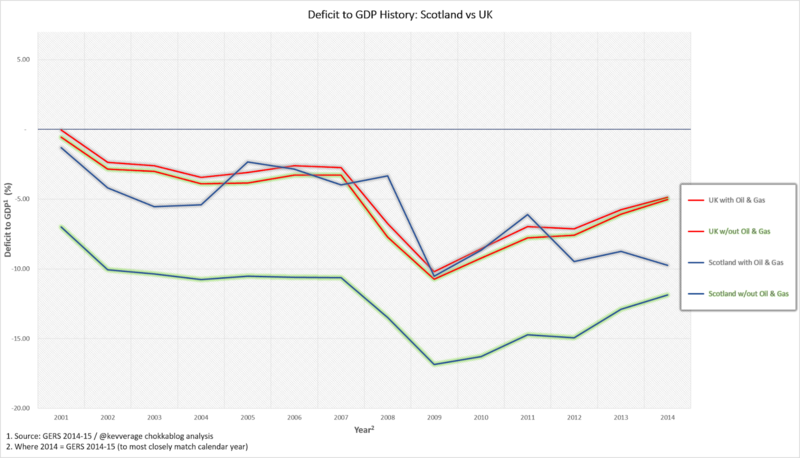 The UK reported deficit increases by only £3.6bn so this implies an increase in the reported deficit gap between Scotland and the UK which is reflected in this blog. See GERS Appendix B for more detail. This is just so much White Noise to the hard of thinking. When GERS is favourable its proof, if any were needed that Scotland is being robbed. When GERS is unfavourable its proof, if any were needed that Scotland is being held back. You can conjure any argument for any fixed position however irrational that is. In fact, the more irrational the better for many as it proves to be an impenetrable argument to any kind of logical analysis. It's not our revenues that are the problem, those are about the same as the rest of the UK. The problem is providing good services in a large country with relatively small population. How is that holding us back? Oof. And the first few months of 2014/15 was before the collapse of the oil price, so imagine the position next year... If figures like this don't impact the SNP's lead, nothing will. Maybe you could analyse discrepancies in GERS modelling compared to UK generated dates using, presumably different modelling. An example is VAT receipts for the 2014/15 fiscal year. The GERS VAT does have Scottish VAT receipts above the UK average and the reason given by HMRC appears to be a different approach taken to rebates. £1,6bn is a massive difference though to just brush on top or under the carpet. Which figure better represents Scottish VAT receipts? Many claim that GERS doesn't truly reflect actual data, usually those that don't like the final figure. It'd be interesting to know how accurate GERS is (are we talking + or - 0.5%, 5%, 10%?) and which figures quoted utilise a favourable or unfavourable UK per capita indexing. 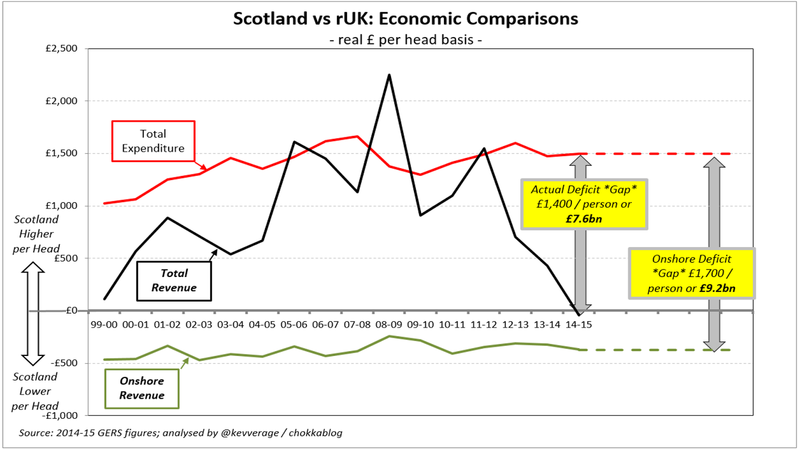 Also, why do people tend to compare GERS to the UK average? At least make it meaningful by offering a direct comparison to rUK data. On VAT IIRC that's an accounting policy difference that nets out by the time you get to deficit. Great work Kev, it's nice to see what those of us with more practical heads and a rudimentary understanding economics were talking about while the others were planting wish trees, laid out so clearly. I come out in a cold sweat when I think of how close Scotland came to complete disaster. I think this is just a poor attempt by Kevin to divert attention from the much more important topic of Sunday trading. No doubting the part-awful message from the numbers (I say part only because the rest of the awful message will come in the 2015/16 numbers). But while I agree a bullet was dodged on Indy, it's worth being cheerful that the underlying recovery sans oil continues. The more we drive the volatility out the fiscal position whether Indy or not, the better for public services, jobs, economy etc. It's just such a shame that to applaud that improvement one must first pause to sigh over the state our finances have been driven down into. One ray of hope (tinged by the pain they went through) - Greece went from 15% deficit at their worst, to 3% deficit now, in 5 years. It just wasn't anyone's idea of fun. I'm not sure or knowledgeable enough to comment on how accurate the GERS figures are. Firstly, as a democratic unit (whether or not you believe Scotland is a nation or not it is a democratic unit), Scotland must be either a net contributor or at least pay its way in the Union. Nothing else is acceptable to me. Nothing. I will not accept being subsidised by another democratic unit. (UK or whatever) whether independent or not. I will never support dependency. And I don't see how that demonstrating dependency should be a reason to celebrate. Secondly, if oil is failing so badly, we must be putting in place new industries and ways to cope with this. And we need the power to do this. Do I trust Westminster and the rest of the Union to do that for us? No, because at heart I do not believe that they want the best for Scotland or that they have our best interests at heart. We're not dependent upon another democratic unit, we are part of the UK as a democratic unit, because we were specifically asked and we chose to be. End of story astrpoet. BBC Scotland news reporter paraphrasing an SNP spokesperson at the end of the report saying the SNP were complaining that we could have had an oil fund and blamed Westminster again! Except we could not have had one ! So between the brass neck of the SNP and poor journalism again by the BBC for not highlighting it ! The SNP hid there own Scottish Government report , which only got released through a F.O.I. 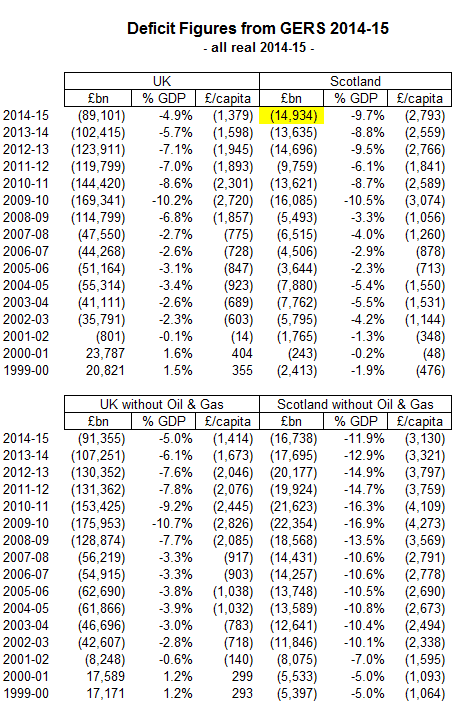 request, clearly showing we could not have set up an oil fund as only once since 1999 we were in fiscal surplus ! You can show as many graphs as you want. Truth is NO ONE knew with any certainty what the future held whether Yes or No. "Past trends should not be taken as a guide to future performance", as anyone who owns shares knows. With Yes vote I agree the future may have been more uncertain. However, the principal of a country running its own affairs, rather than being governed by a democracy where 9 votes in 10 reside in another country is key here. Why should we have Trident, The Poll Tax experiment, Fracking and a Brexit imposed upon us via the will of another nation? The fancy graphs and rhetoric spouted during the referendum from the No campaign utilised something inbuilt in the human psyche, in that fear of change and the unknown takes precedence over any idealism. The usual hocus hubble pocus bubble with jagged coloured lines and column inches of necromantic numbers. Have you managed to turn base metal into gold yet Kevin? As a scientist I would like to see the facts first. It appears to me that both sides of this partisan debate are trying to trade advantages over each other, based on an incomplete understanding of all said facts. So what I would like to see is a non-partisan approach at collecting all the data available and seeing where Scotland finances truly are. This would require a lot of research and the governments to open their books to independent auditing. Then if they are in the negative, make sensible suggestions on how to improve the situation. If the contrary is true, we would have the choice still to remain and "pool and share" or decide to opt for more autonomy or full independence (in or out of the EU). Disclosure. I write this as a person who believes that things can only get better if we have full political and economic powers in Scotland. However at a more basic level, I just want life to be better for people and if that is in or out of the UK, so be it. "The fancy graphs and rhetoric spouted during the referendum from the No campaign utilised something inbuilt in the human psyche, in that fear of change and the unknown takes precedence over any idealism." The problem here is that you're operating from the perspective that those who opposed independence were all either diehard Unionists or people who had been frightened into a No vote by the propaganda of diehard Unionists. Most of us are pragmatic about independence. I personally was quite open to the idea and supported having a referendum. But the best way to judge whether it's a good course of action or not is to look at what it would mean for the country and choose the best option. Is the information published by the Scottish Government imperfect? Of course it is. The information is always imperfect when you're discussing a future policy - fracking and Trident included. But you judge the situation on its own merits and make a call on it. In this case the figures show we get a fairly good deal from being part of the UK. We're a large and relatively sparsely populated country, which makes delivering public services more expensive than it is across the UK as a whole (that's one reason why our spending is above the UK average). We're also an economy that would be subject to a lot of volatility due to our reliance on oil and large financial sector. On both counts there's a lot of merit in pooling sovereignty and being part of a larger territory, while having areas that are best determined in Scotland devolved to the Scottish Parliament. Our membership of the UK means we can afford a level of public spending greater than what our revenue alone would allow (as GERS shows) and be protected from instability (as the oil price fall has shown). The "cost" of pooling sovereignty is you have shared institutions to determine those policies that you share with your partners. There's nothing shockingly undemocratic about cooperating with other countries for mutual benefit and in this case Scotland's place in the UK is of a very large fiscal and economic benefit for the people of Scotland. Thomas, as a scientist perhaps you can point us to those areas where you feel the current facts/data are insufficiently complete or accurate for a robust conclusion to be reached. Or to where analysts of said data (Kevin would make a most suitable research subject) demonstrate an incomplete understanding. And finally to the facts/data and methodology on which you base your own belief (sic) that things would get better if we had full political and economic powers in Scotland (which I assume means independence). Fair enough. Just trust the advice of people that do understand it, and you'll be ok.
Norway is an even larger country with a similar population size, yet it does not need to 'pool sovereignty' to be successful. Perhaps because it keeps all of the revenue generated from it's own resources and controls how that revenue is spent. You still have that problem in an independent Scotland. 5,294,999 votes out of 5,295,000 would reside in other people. What would be your principal principle for that? An excellent comment which quite succinctly gets to the nub of the issue. I fear, however, that those minded to separate from the UK are long past the point where rational thought has any effect on them. As Anonymous at 6.53 pointed out, there are no facts and no arguments which they cannot warp to support their point of view. I would have significantly more respect for them if independence supporters were at least prepared to address the facts and have a grown-up conversation about what they mean and how they would tackle them. Unfortunately, they simply ignore the facts and engage in diversionary tactics. The strategy is virtually identical to that used by Creationists and Intelligent Design proponents to undermine evolution. You make enough plausible seeming objections to create doubts in the minds of the less well-defined, and bingo, you've given them an excuse to think no further and indulge their gut instincts. Once that happens, you've lost them. There's now a large number of people in Scotland who will only be convinced that independence is a bad idea when we're experiencing Greek levels of austerity, when the tax base has been shredded by the flight of large numbers of high paying jobs, when financial services has gone the way of the shipyards and coal mines, when public sector pensions have been shut and replaced by much worse schemes, and when it becomes clear that Ireland is a more likely role model than Norway. The big difference is that the No side were very clear that putting your economy at the mercy of such an unpredictable and volatile commodity was unwise and fraught with danger. It was the Yes side who implicitly rejected your caveat about past trends, and who shouted down anyone who brought it up. You see another nation; I and many others don't. We see that compromise is required in grown-up polities, and that being part of the UK allows us to have a standard of living which would not be possible for an independent Scotland, in at least the short to medium term. I personally think we'd fall behind rUK in terms of general prosperity and living standards and that gap would never close. Look across the Irish sea. There were many inbuilt somethings awakened by Yes rhetoric during the referendum campaign, few of them admirable, since they sprang in the main from tribalism, grievance and an unreasoning and adolescent view of a Brave New Scotland (which unlike every other state in the history of the world will not be run by and for the benefit of its elites). The GERS figures once again show a Scotland unable to support itself in the manner to which it has become accustomed if it separates. Yet we still see Nationalists unwilling to acknowledge this and face up to the real hard work of constructing a viable plan to deliver a truly prosperous independent Scotland. When they do that, they'll have my grudging respect. On the point of your assumption of my preference for full independence.That is one option. I am open to other situations. For example it is possible to have a position where all power resides in the Scottish people (via PR elections to the Scottish parliament), but we decide to remain within a federal UK, where we would pool and share resources, whilst lending authority to a federal UK parliament. Thus power is concentrated at the periphery (similar powers being sent to the English regions as well as NI). This reverses the current situation where the parliament in Westminster has too much power for its own and the country good. The same principle could also apply to economic levers to, with UK level negotiations to hammer out a consensus and regional differentials. "Pooling sovereignty" is the essence of democracy. All democratic countries do it. However, the countries themselves are relics of feudalism. I can't see why you have a preference for one feudal relic over another. Is there a reason? I'm left puzzled by your second sentence. Have you read the article? @Drew "Scotland is in dire financial straits in terms of our public finances. We are spending well beyond our means. None of the main parties in Scotland have anything remotely approaching a plan to get greater equilibrium between our revenue and spending." I have to disagree Drew. 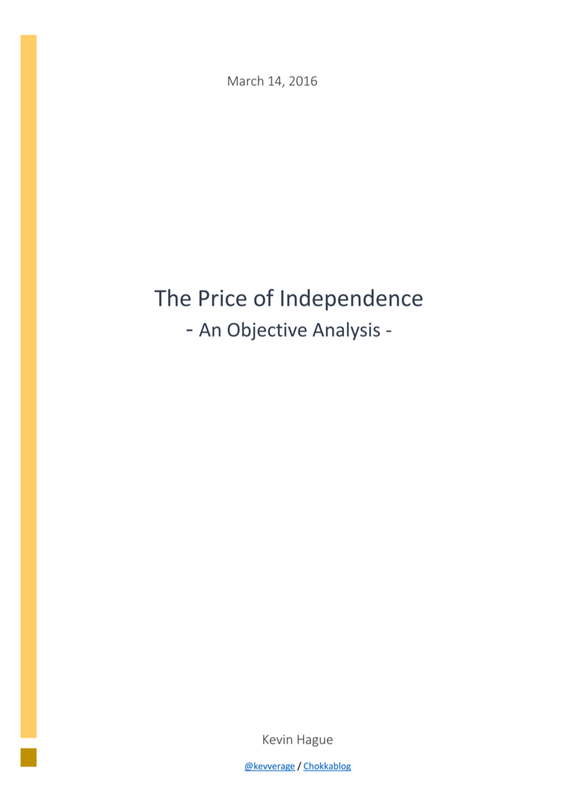 The parties that wish Scotland to be part of the Union are implementing a plan that protects us from what you refer to as "dire financial straits"
And as Kevin's skilful presentation of the primary source of data proves. (The data used by both Yes and No. It is an effective plan. Pooling and sharing works well for all UK parties. Independence would create a significant economic crisis. Without it there is no crisis.